Happy Valentine's Day, everyone! I personally love this day because it's yet another opportunity to talk about the most important kind of love -- SELF-LOVE. 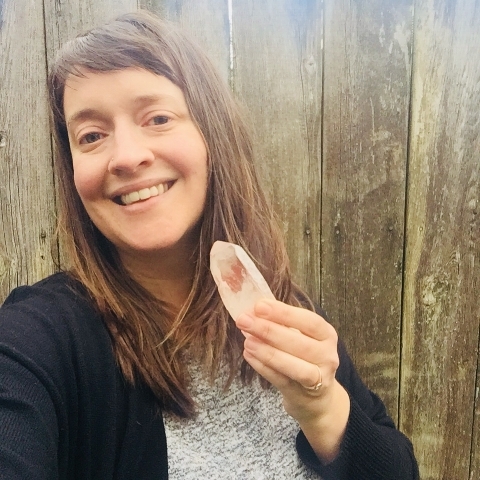 This month's Next Generation Yoga Lesson Plan "I Love Myself" is all about self-love and bringing a piece of Rose Quartz to class can take the self-lovin' to the next level. Rose Quartz is a stone of the heart and unconditional love for oneself and others. It's one of the most important crystals for healing the heart and the heart chakra ... and it's also really pretty! At the beginning of class, the children can pass the Rose Quartz around the circle and share what they love about themselves and/or say the affirmation, "I love myself!" I'm smiling right now looking at this beautiful crystal that has touched over 100 pairs of hands* in the last week. The kids have LOVED the self-love sharing experience and I'm feeling inspired to use crystals more in the classes I teach, so stay tuned for more suggestions and teaching tips with these special and magical Kids Yoga class props. Have you used crystals in the Kids Yoga classes you teach? Or are you inspired to do so? I’d love to hear your thoughts. Feel free to comment below. If you don’t already have the NGY “I Love Myself" Lesson Plan, you can purchase a copy for 2-7 yr. olds here and/or 8-13 yr. olds here. * I'm definitely disinfecting the Rose Quartz with doTERRA's On Guard in between classes and it will certainly be ready for a cleansing after tomorrow's classes! Lol!